Dear United States Government: S#!T happens! United States of America, supposedly the world’s strongest country (both financially and military wise) is into yet another problem after it just tried to get up after the Global Recession in 2008. Few experts say the problem can be solved while others say it’s a trap and another Financial Tsunami is ‘in the making’. The United States Congressional Budget Office expects that the budget proposed by the Obama administration in February would add $3.8 trillion to the national debt between 2010 and 2020, the debt-to-GDP ratio will soar from 62 per cent to 90 per cent. That $3.8-trillion net debt increase reflects a roughly $5-trillion increase in the deficit, owing to higher spending and weaker revenues from middle – and lower-income taxpayers. Well I don’t know the future but this is not so easy. Swedish economists Andreas Bergh and Magnus Henrekson affirmed that, as a general rule, every 10-percentage-point increase in the size of government in wealthy countries reduces economic growth – by as little as 0.5 per cent a year, or as much as 1 per cent. 1 So, does all this affect India? The regulatory framework didn’t match the financial progress. Be it complex derivatives, structured products, shadow banking, off-balance sheet financing, these were not given required importance while framing policies. In few cases, laws were mended and enforcement made weak were equally responsible. The Senate will now approve the deal to cut the country’s bulging deficit and lift the $14.3 trillion debt ceiling enough to last beyond the November 2012 elections. So, does all this affect India? India claims to be decoupled from external factors because of its consumption led growth but one could see how the markets behave when EU crises sharpened or US senate increased the debt ceiling. The ripples are already observed in the economic survey report released yesterday as India’s expected GDP growth rate for 2011-12 estimated at 8.2% as compared to 8.5% registered last year. Is it just wait and watch or it is time for fiscal austerity? Excellent Google Plus Users Infographic! The Real Grass-roots Innovation by Indian wins Best Product Design! thumbs up for the title… I just hope that I don't loose my job! It is not the end of the Great American Dream. It is only a vital correction. It may seem foolish to some economics pundits. But it is an usual thing for USA. It will rise from its ash. The storm has halted for now, but you can say that the stoppage is slated only to gather more push and power to cause an ultimate disaster. The US has got away with a resolution allowing the country to borrow more, but that does not change its economic reality (or reverse its humongous $14 trillion+ debt). Let me put it like this – a person with a flab needs a dieting plan to cut his excess; but, on the contrary, he eats more to relieve his food pangs, further adding to his dietary woes. 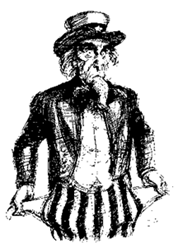 Moreover, despite US debt ceiling raised, by now markets are more that assured that the credit rating of Uncle Sam is likely to be downgraded within a quarter or so, by at least one of the leading agencies. And, if that comes true, we might just see a panic-driven downturn, with ripple effects across the globe, including emerging markets.